Do you have any good recommendations for protective gear that you can use when sparring? Are they even really needed? It depends on your modus operandi. You can spar without any protection - but it requires a lot of control. When going with more speed, I use Airsoft-goggles and padded gloves as a minimum. When going faster, a fencing mask is required. For full speed, my HEMA-gear is used: Fencing mask with back-of-the-head protection, thicker gloves and a padded fencing jacket. I would recommend a cup for men, btw. Leg-protectors can be used (though I hardly do so). Some people use lacrosse or hockey gloves, but I find it's difficult to do any kind of saber spins using them. I use these padded gloves from Century and a fencing mask. I also have a Tae Kwon Do chest protector, though it was purchased many years ago and the exact model I have I am not sure if they still sell or not. As attacks to the legs are almost certain to fail, no one should be trying to attack your legs while sparring. I do think protective gear is necessary if you intend to spar competitively as a sport. My main criticism of groups like Ludosport is that their fighters spar without protective gear in tournaments. It's neither safe for the participants (it takes just one glancing blow to an eyeball to permanently rupture it -- not to mention losing your front teeth) nor leads to people behaving in any kind of semi-realistic way during a duel. I see a lot of lunging spinning strikes in their fighters, and I feel those moves wouldn't be among the ruleset if blows to the head and chest were legal targets -- which I can't imagine they are if nobody is wearing protective gear. These sabers blades are made of polycarbonate and leads people to mistakenly think they are harmless toys, but nothing could be further from the truth. Impact weapons are just as dangerous as edged weapons. Impact weapons are simply easier to protect against if you are wearing the necessary equipment but if you don't wear that gear you are leaving yourself very open to injury. Depends on the style of fencing. One-handed sweeps can be really fast and if set up right, won't be subject to exposing the head. Or think of the German "Geisseln" in longsword, where you attack the leg by letting go with the right hand to elongate your reach (has been misused in tournaments a lot ...). It's basic geometry that you should never attack the legs. In order to attack the legs you have to get well within range of where the opponent could attack you. Anyone can see this by simply holding a saber / sword with the tip against a wall and then raise the tip down to where an imaginary leg of an opponent would be. Because your shoulder is a fixed location, the tip will not be able to fully reach the wall anymore. Furthermore, when you crouch to attack the legs you make yourself vulnerable to attack as you cannot defend yourself against a with a parry. Leg sweeps are only possible in unarmed combat because the angle of the sweep allows your head to be held back and the only way the opponent can attack you is by getting into range of the sweep; furthermore a leg sweep is actually a counter-attack to a kick. I'm not sure what Geisseln is but if it's anything like the Ludosport leg strike (which seems to be based off a leg sweep, which is why I mention this) it has the same problem. When wielding a sword the body mechanics are different. 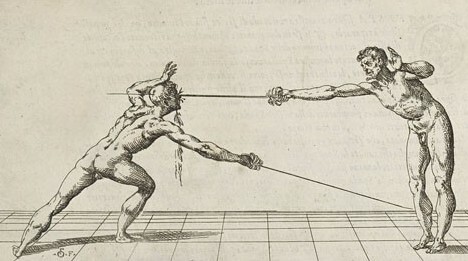 Your head is forward and therefore vunerable to attack from the opponent's sword thrust. For reference of what I am talking about in Ludosport go to 0:34 in the video below. Had his opponent not made the very obvious mistake of trying to jump during a swordfight, that move would have been suicidal. The only reason it worked is because his opponent also commited suicide by jumping in response. Another example is at 1:15 in the below video. Ludosport shouldn't be counting these as scoring techniques. Someone is eventually going to get a broken face and it's just bad form. It's basic geometry that you should never attack the legs. We have a lot of leg (and even foot) attacks in Bolognese fencing, German longsword and military sabre - and I'm not counting sword & shield techniques here. It all depends on the set-up. Mostly it's a counter-attack, where the agent has already commited himself and the patient can step offline and cut at the leg (with or without a parry). It's also a very common technique in french Canne de Combât, often seen in a low crouch, the head far back and the stick-hand reaching out. But that's not so easy to do with a heavier lightsaber. And commenting on the Ludosport examples ... Better not.